This statement was originally published on imi.org.ua on 18 January 2016. 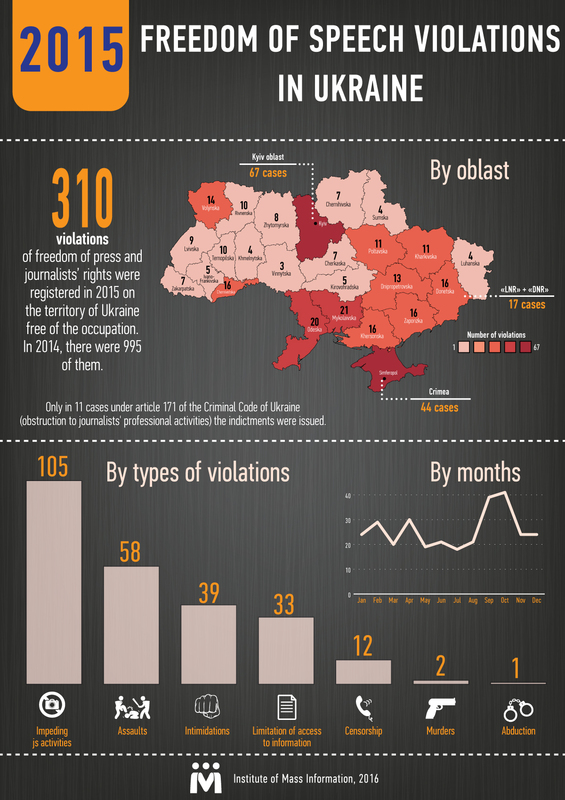 In 2015, in Ukrainian territory not under occupation, there were 310 registered violations of the freedom of press (as of December 24), which is three times less than in 2014 (995 cases). This is the data of the annual survey of the Institute of Mass Information "Freedom of Press Barometer". Together with Crimea (44) and the occupied territories of Donbas (17), this year , the total number of violations of freedom of press is 371 cases. Click here to view the full infographic on IMI's website. The category with the largest number of violations was "Obstruction to Lawful Professional Activities of Journalists" (105 cases), which is almost by 1.5 less than the year before (in 2014 - 150, in 2013 – 130 cases of obstruction). According to IMI data, the peak of obstructions to journalists was in September and October of 2015, during the pre-election campaign for local elections. The people who were impeding journalists most were the members of election commissions, who either did not know the legislation on elections or did not wish to respect journalists' rights. The second place by the number of cases is held by "Beatings and Assaults Against Journalists" - 58 cases, which is five times less than last year (in 2014 - 286 cases, in 2013 – 97). The prevailing number of cases of assaults against journalists in 2015 was committed by private individuals and unidentified people (unlike the same acts in 2014 and 2013, when the assaults were chiefly committed by law enforcement officers and local officials). "Threats and Intimidation" also made it into the top three by the number of registered cases. In 2015, 39 such cases were registered, which is by almost three times less than last year (in 2014 - 98, in 2013 - 35). Among the negative tendencies noticed by IMI in 2015, the number of cases of restricting access to public information for journalists increased. This year, twice as many such cases were registered (33), compared to last year (14), in 2013 - 13 cases. In 2015, access for journalists was restricted mainly to the bodies of local self-government (oblast councils, oblast state administrations, city councils). In addition, this year, according to IMI records, 2 journalists were killed (in 2014 – 7, in 2013 - none). On February 27 in Pisky, Donetska oblast, a photo correspondent for the newspaper "Segodnia", Serhiy Nikolaev, was killed by a mortar. According to his colleagues, he was wearing an armored vest bought for the money pooled by his colleagues from various media outlets. Due to this, IMI addressed top managers and owners of mass media, emphasizing that sending journalists to the combat zone without adequate protective gear, without medikits and without basic knowledge of first aid is a faulty practice. On April 16 in Kyiv, unidentified people shot and killed the pro-Russian writer and blogger Oles Buzyna. Police says that the main version in this case is that the murder is related to his professional activities. The LPR militants are holding hostage Luhansk fixer and freelancer Maria Varfolomeyeva, who was detained as she video recorded the footage of housing at a street in Luhansk on January 9, 2015. For comparison, in 2014 IMI registered 79 cases of journalist kidnappings and holding them hostage. Twelve cases of censorship were registered, which is 11.5 cases less than in 2014 (138). In the Crimea annexed by Russia, 44 cases of freedom of press violations were registered. On the peninsula, Russian special services, Roskomnadzor, and Crimean occupation authorities pressured mass media. The Russian FSB suspected journalists of "extremism". Some mass media – such as the Crimean Tatar channel ATR – were forced to cease operation due to Roskomnadzor denying them the license for operation on the occupied peninsula. Many editorial offices were forced to leave Crimea. In the occupied territories of Donetska and Luhanska oblasts, militants of the so-called “LPR” and “DPR” during this year were detaining journalists, scrambling and blocking Ukrainian TV and radio channels, attacking and vandalizing the homes of journalists, issuing decrees banning Ukrainian media from covering certain activities of theirs (not admitting Ukrainian journalists to events) – in total 17 registered violations. This year, the regions with most violations were: Kyivska oblast — 67 cases (in Kyiv proper — 62), Mykolaivska oblast – 21, Odeska oblast – 20, Donetska oblast – 18, Chernivetska oblast — 16, Khersonska oblast — 16, Zaporizka oblast — 16, Volyn — 14, Dnipropetrovska oblast – 13. The peak of the violations were in September (39) and October (41), on the eve of elections. For more details about freedom of press, please refer to web-site of IMI in section "Freedom of Press Barometer". The Institute of Mass Information conducts monthly national level monitoring of freedom of press in the following categories: physical aggression, censorship and access to information, economic and political pressure, legal pressure, cyber-crimes against mass media and journalists. The monthly report includes only cases related to freedom of press and professional journalist activities. More details about the methodology can be found here.